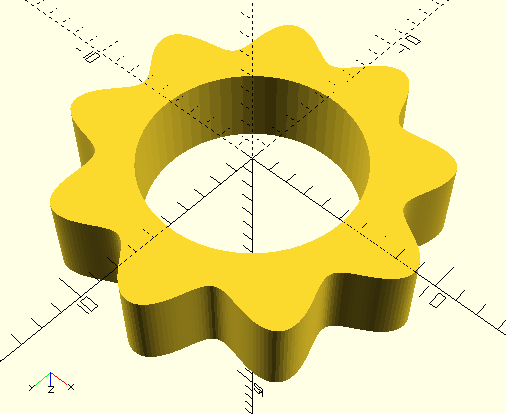 OpenSCAD - Behaviour of 2D in 3D space? Behaviour of 2D in 3D space? I wasn't sure what I expected it to do. In preview it looks 3D. In render it seems to take the projection of that 3D view. Should intrusion into 3D by a 2D object result in a Warning or error? Re: Behaviour of 2D in 3D space? I had some surprises in this space recently too. I then updated my developer version and it surprised me in a different way. I’d have to reconstruct the specifics but I’m happy to do so if folks think there might be a regression. were thin 3D objects, and are rendered as 2D objects. So the circle looks as I fully expected. a square, circle, or polygon displays as thin 3D objects, but renders as if it were a projection. I don't think a rotated 2D figure should be any different. Try this one, just for fun. > I wasn't sure what I expected it to do. > In preview it looks 3D. > In render it seems to take the projection of that 3D view. > Is this expected behaviour? > Should intrusion into 3D by a 2D object result in a Warning or error? and wishful thinking drives a lot of decision-making. exist in a 3D space, and that's why you get that result. Also if you rotate 2D objects so they are on their edge you get warning. Rendering cancelled on first warning. This is even true if you rotate it back to the XY plane. I don't think this warning is useful because if the 2D object ends up back on the XY plane it should be valid. I would rather it was silent and correctly rotated in 3D and until it gets projected to 2D. Preview should match F6 of course. > exist in a 3D space, and that's why you get that result. 2D objects to create some rather interesting shapes. I have been going through all my objects rewriting them to be unions of extruded 2D objects to avoid as many 3D differences and intersections as I can. By doing that I have reduced the time to draw all my objects from 972 seconds to 194. I have learned a few tricks on the way to make things that look inescapably 3D out unions of extruded 2D. For example these draw in 0 seconds. I think they used to take about 17. 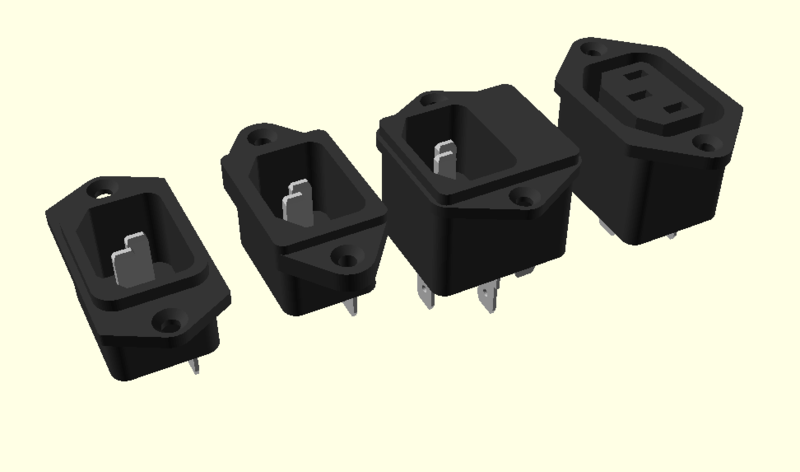 I previously made the cavities by subtracting two linear extrudes. That takes ages because I render all differences with CGAL to avoid clashes between negative objects and the curved cavities have lots of vertices. I now linear extrude the difference to make the walls of the cavity and then fill in the back with another linear extrude. The countersinks are creative because on the face of it you need to subtract 3D shapes. What I actually do is put some slightly bigger straight holes in the linear_extrude() of the flange by subtracting circles. 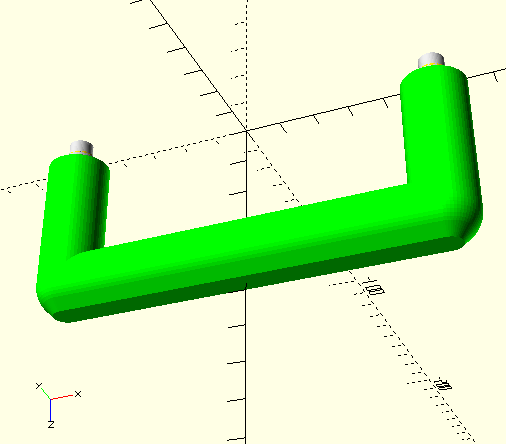 I then rotate_extrude a cylinder with the counter sunk hole in it and union those into the holes in the flange. Union is free in preview because it just draws both parts and there is never any z-fighting if they are the same colour. I did the opposite thing with countersunk, pan and dome screw heads. I rotate extrude the basic shape of the head with a cylinder missing where the slots go and the linear extrude a circle with the slot cut in it and inlay it into the head. It has taken me weeks because I have had to re-code everything, moving all the differences and intersections into 2D. Awesome results! The difference between the obvious solution and an efficient one can be massive - both in terms of performance and the effort required to get there. That delta is a big reason, IMO, why we need to settle on a good library and packaging story, to help increase adoption. Fascinating work - thank you! 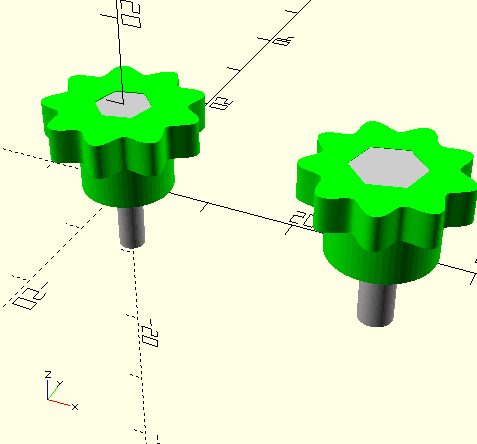 I’ve has complicated designs (e.g., complex compound planetary gears) that take up to 30 minutes (!!) to render. I’ll have to rethink parts of it using your insights. Any thoughts about posting some example code? The differences is now a on a plain cylinder, so is a lot faster because there are less vertices and CGAL slows with the square of the vertices I think. I then union with the outer bit, which I make with a slightly smaller hole in the middle. That is very fast because it is an extruded 2D shape and I don't need to use CGAL when previewing unions. So my test which draws two difference sizes goes from 6 seconds, to 0 seconds. Another thing I found is avoiding any unions inside a 3D hull by using repetition instead of for loops and not using translations or rotations to operate on more than one child as that does a union as well. Same with if. I.e. I repeat the if or the translation instead of using one with braces. This even speeds up difference but the code gets uglier and uglier. Again moving the subtraction to a simple cylinder and placing the ends in the hull with repetition instead of a loop to avoid unioning two objects with a lot of vertices before the hull is taken. Thank you for the super detailed reply! I'm going to have to think about redesigning some of my work based on this. Allowing modules to return multiple children and getting rid of implicit unions that are only there to force one child would be a big improvement.That would avoid the need to unroll code to make it faster. It would also make children(i) work properly. Reordering the operands to union and difference to have the low vertices ones first (second for difference) should not be too hard. Decomposing everything into union of 2D extrusions would be difficult to automate. It is only necessary because CGAL is so slow. I think there is a lot of scope to make CGAL go faster because it seems to depend on the number of vertices, regardless of whether they take part in the union or difference. I.e. the union of two non-overlapping objects is slow but it should be easy to simply concatenate the polyhedra when their bounding boxes don't intersect. Also many faces in a union or difference don't need modifying. 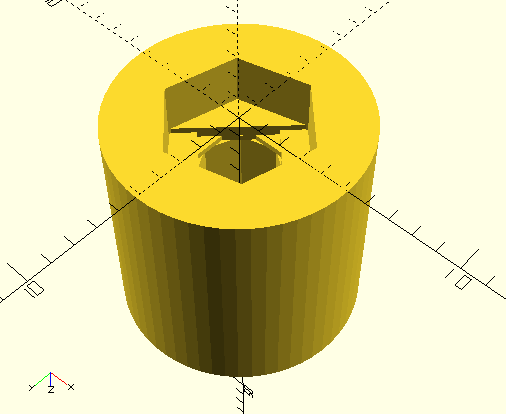 For example a hole down the middle of a cylinder only changes the endcaps but it it gets much slower with facets around the edge, which should simply be passed through to the result. The slow bit should be where the objects overlap and new vertices and facets need to be generated. Perhaps there is something I don't understand but these seem easy optimisations inside CGAL. > where the objects overlap and new vertices and facets need to be generated. cylinder to find out that they indeed do not mess with eachother. Yes the faces that don't intersect with any others need to be checked to know they can be passed through intact, but surely that doesn't take seconds on a processor running at GHz. A crude test like looking if the bounding boxes overlap would eliminate most of the faces in a typical union or difference. I’m not sure I agree with the statement “computers need to do the math and check every vertex”. All sorts of possible optimizations exist for this type of computation including precomputing binary space partitions and/oct-trees to avoid the N^2 vertex check. Cgal may not implement these (which is absolutely fine) but I don’t believe this is an inherent limitation. Because all of the vertices are in a Euclidean space (e.g., where the triangle inequality applies), if face A does not intersect face B, then it’s not possible for face A to intersect any face C where all of the vertices are further from A than the vertices of B.
I’m not trying to nit pick but if some aspiring young programmer out there wants to take a spin at improving this, I wouldn’t want anyone to think it’s an impossible task.